Anabelen Diaz was born and raised on the west side of Chicago. She completed her Bachelors of Public Health with a Sociology minor at UIC in 2016. As an undergraduate student, Anabelen was a member of the Student Activities Board (SAB) and Alternative Spring Break (ASB) where she got to travel to Philadelphia, New Jersey and NYC. Anabelen is also an alum of the Urban Public Policy Fellowship (UPPF) where she interned at the Latino Policy Forum. For the past two years, Anabelen worked as a Research Associate for an oral health study at the UIC Institute for Health Research and Policy. She recently enrolled at the Jane Addams College of Social Work where she will be focusing on mental health. 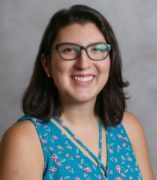 Anabelen will also be applying to the public health program for the MSW/MPH joint degree to expand her knowledge on health policy to reduce health disparities and improve health outcomes in Chicago.